The search for a gleaming smile, but is teeth whitening really safe? We’re now into week 3 of Britain’s National Smile Month that runs from 15th May until 15th June and so we think that it is time that we discussed how professional and qualified teeth whitening treatments can really help to provide that gleaming smile you’ve always wanted. But at the same time we feel that we must warn readers about the serious dangers that can occur if you use illegal teeth whitening treatments or go to unlicensed practitioners. First of all we should make it clear that it is illegal for anyone other than a qualified dentist or dental health professional to provide teeth whitening treatments. Beauty salons and such, often offering cut-price incentives, are breaking the law. They do not have the specialist training, the dental qualifications or the health understanding required and they are putting unwitting clients at serious risk. In fact prosecutions of these establishments by the General Dental Council are rising year on year. At Carisbrook, as one of the region’s leading teeth whitening clinics, we have to say that we have seen serious chemical burns along with badly damaged teeth that have been caused by inexpert and illegal treatments. Equally worrying are the illegal (often dangerous) teeth whitening kits that can be purchased via the Internet. Some kits seized by Trading Standards Officers in London contained nearly 60 times the legal level of the bleaching agent hydrogen peroxide. On the other hand, legally approved teeth whitening kits that can be purchased over the counter of respectable retailers are generally safe, but in order to comply with stringent legislation these kits contain very low levels of bleaching agent and so are not always very effective. Having said all that, good, fully-approved teeth whitening treatments provided by highly-qualified dental experts can dramatically improve the appearance of your smile and there is probably no better time to discuss this with your dentist than during National Smile Month. Take a look at our Teeth Whitening Manchester page and you will find lots of good, professional advice plus details of the various teeth whitening procedures we provide. Most importantly though before we commence any treatment we will examine your teeth to determine the reasons for teeth discolouration. Is it genetic? Or is it caused by your lifestyle – including drinking coffee, tea, red wine or smoking? Only when we have completed our examination will we recommend the treatment that is best suited for you. These peripheral stains can usually be quickly removed by our Airflow machine that swiftly cleans and freshens the teeth leaving them with a much whiter appearance. We may recommend a home whitening treatment course, or one of our in-clinic treatments that include laser whitening using our ZOOM! machine or the very latest ‘Enlighten’ technology – the revolutionary new teeth whitening treatment from the USA. Probably the most advanced teeth whitening process there is. Take a look at our Teeth Whitening page to read more about the various options that we offer. 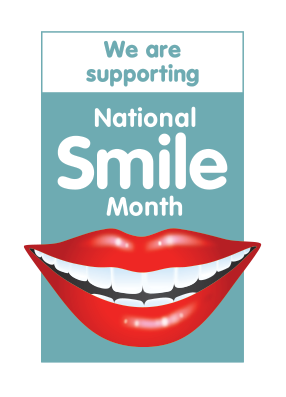 National Smile Month is a perfect opportunity to talk to us about teeth whitening and thanks to the Offers that we currently have you could also save yourself money. As well as a FREE CONSULTATION for all new patients we are also offering £100 OFF HOME TEETH WHITENING. To take advantage of these special offers you must contact us soon. You can call us on 0161 951 7295 or alternatively you can contact us by using the online form on our Appointments page.